In North Carolina where I grew up, baiting deer is commonplace and is a traditional hunting method. I grew up putting out corn and hunting over it a lot as I learned to hunt, but I always had mixed results. As I have grown further as a hunter I have relied more on my scouting skills and knowledge of deer behavior to kill deer. While I rarely hunt over bait anymore, I will put it out for one purpose- to kill deer in urban settings where food is limited and the deer herd is in desperate need of reduction. For other hunting scenarios where the chance to harvest a mature buck is my top priority, I choose to not bait. Here are some thoughts and reasons why baiting may actually be a detriment to your hunting success and not a benefit. Every deer is an individual with a unique personality. Some tolerate human presence more than others and may be comfortable feeding in daylight, while others may not be comfortable frequenting a site, such as a bait pile or feeder, that humans visit often. As a generality, many mature bucks seem to be very wary of bait piles, which is probably a major reason they have survived to maturity! Running a bait pile may be a red flag to deer on your property, alerting them that there is active hunting taking place. This is only exacerbated by hunting over the bait regularly and allowing deer to pattern you. I have seen many scenarios where deer that are near bait piles are very jumping, spook easily, and are prone to jumping the string. While eliminating baiting may make deer less concentrated, it will lead to them behaving more naturally and will make encounters with deer more likely to lead to a shot. Hunting over randomly placed bait piles during the rut leads to frustration, as you seem to see minimal rut movement. This is simply because most bait piles are not in an area where traditionally bucks seek does. Yes, you may see a few bucks over a bait pile during the rut as some will be stopping by the bait to grab a bite while out searching for does. Others will be towed behind does using your bait pile. However, a bait pile is not a great place to see cruising and chasing because they are usually not located within bedding cover. Instead, you should focus on pinch points, travel corridors, topographical features, and bedding areas during the rut, as these areas will see a lot of buck movement. Hunting over bait eliminates much of the need for scouting and woodsmanship. One can walk into almost any woodlot or forest and pour out corn and have deer using it at some point. Those who strategically use bait can be skilled hunters, but baiting often becomes a crutch to hunters and is their glass ceiling prohibiting them from developing advanced woodsmanship skills. Instead, if you challenge yourself to begin scouting for natural features, like topography, that funnel deer movement and leave the corn at home, you will learn much more about your quarry. 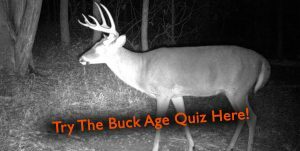 While this may lead to some slow hunts in the beginning, it will be well worth it when you begin to develop an understanding of where and why deer are traveling and how you can use natural features to outwit them! While the skilled hunter can place bait piles at natural travel locations, it is difficult to learn how to locate these spots without ditching bait for a while. I have killed deer over bait as well as many where no bait was used, and I can tell you that personally harvests have been twice as rewarding when deer were not standing in a pile of corn. Something about shooting deer in a bait pile just does not feel as successful to me as scouting and hunting natural movement. This is a point that everyone will feel differently about. For some, hunting over bait is exciting, while to others it may feel less sporting and less challenging. You will have to search your soul and figure this one out for yourself, but I encourage you to try it both ways before settling on a hunting style. Hunting over bait can be an effective way to take deer, but may lead to a reduced hunting quality experience, depending on your goals and desires. It can impact the quality of deer you see, your knowledge as a woodsman, and the amount of rut action you see. I encourage you to take these points and evaluate your current hunting scenario and goals to decide whether hunting over bait is for you. Hunting over bait certainly has some applications, and this is not meant to talk down to those who bait. Rather, I desire for people to try different hunting methods and try to be the best hunter that they can! Finally, always make sure to read your state and county hunting regulations before each season to make sure baiting is legal in your area! Regardless of your personal feelings, it is important to follow regulations that are in place. Totally agree. I sometimes think we should where patches on our sleeves proclaiming “Corn Pile Security Guard”. I hunt two small parcels in NC where bait helps bring deer in. I also hunt in Virginia where baiting is not allowed. I get more satisfaction from the Virginia hunts. I can totally relate, for years I have been in situations where corn seemed like the only choice. Everyone’s situation is different, but it does seem to be more rewarding when you can figure out natural movement! Good luck this year!